Earth Day is April 22, making this a favorite time of year for printer and supplies companies to make announcements about their eco-friendly activities. The latest such announcement comes from HP, which announced new more eco-friendly packaging for inkjet cartridge multipacks sold through warehouse clubs on April 16. · a total carbon footprint savings over one year equivalent to eliminating 750 roundtrip airplane trips from San Francisco to Washington, DC, or the removal of 70 U.S. cars from the road for a year. MeadWestvaco commissioned an independent study of the NatraLock paperboard used in the club packaging. The study found that the product’s lighter weight and fiber-based materials reduced greenhouse gas emissions and results in less aquatic toxicity. An HP spokesperson points out that the new packaging is ideal for the club channel, which promotes buying in bulk—an eco-friendly way to purchase. On April 17, Ricoh announced plans to invest ¥11 billion ($135.1 million as of April 18, 2012 exchange rate) to add three new toner production lines at Tohoku Ricoh Co., Ltd., a Ricoh production plant in Miyagi Prefecture, Japan, that manufactures printers, MFP, and toner. This is one of Ricoh’s facilities that was damaged in the earthquake and tsunami a little over a year ago but has since resumed full operations. Construction is slated to begin May 1, with full operation of the three new lines expected to begin in June 2013. Ricoh is expanding production so as to produce its PxP-EQ chemical toner at the facility. Currently, the company is manufacturing the toner only at its Numazu plant in Japan. The firm says it is expanding production to meet a projected increase in demand for the toner. PxP-EQ toner has a lower melting point than Ricoh’s previous polymerized chemical toners, enabling hardware to start up more quickly from sleep mode. Ricoh says this generation of chemical toner can be fixed at a temperature 30°C lower than the first generation of PxP toner, which was released in 2004. The EQ in the name stands for eco-friendliness and quality, and Ricoh asserts it has made improvements in terms of these areas as well. The lower melting point provides energy savings. 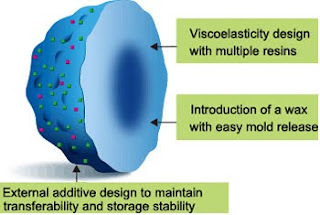 Ricoh is also using new polyester resins that prevent the toner from deteriorating in quality when stored in a warehouse or in transport, which can be a problem with other low-melt toners. Unlike other resins that soften gradually as temperatures rise, the resins used in PxP-EQ toner are designed not to change states until the fusing temperature is reached. Ricoh also says the new toner has a uniform particle size of 5 microns and spreads more easily and uniformly, allowing less toner to be used to produce high-quality, high-resolution images, The color reproduction area has been expanded 10 percent compared with the previous generation of PxP toner. The new PxP-EQ chemical toner is used in the Ricoh Aficio MP C2802, C3302, C4002, and C5002, new A3 color MFPs announced this February in Japan. These machines have not made their way to the United States yet. However, given that Ricoh recently announced these devices in Japan, we would expect to see similar machines using PxP-EQ toner make their way to other markets in the coming months. That Ricoh is expanding production of PxP-EQ toner indicates we can also expect to see the OEM roll out this new toner in more devices in the years ahead. Read more on Ricoh PxP toner. Sharp Imaging and Information Company of America (SIICA), a division of Sharp Electronics Corporation, has announced a collaboration with materials recovery company Close the Loop as part of its ongoing commitment to encourage environmentally improved business practices. This alliance will extend Sharp’s well-known “Stop, Drop and Recycle” program. Close the Loop will manage and facilitate the program by providing recycling kits to companies and institutions that use Sharp toner. Users will receive a kit in the mail with pre-labeled boxes for all Sharp consumables including used toner and drum cartridges, bottles and waste toner collection kits. All Sharp cartridges are 100% recyclable in full support of Sharp’s commitment to the goal of zero waste to landfill. The program is free of charge to Sharp customers. Sharp will have access to valuable information regarding users’ recycling submissions and habits through Close the Loop’s customer data. Sharp can leverage the trend evidence through the development of recycling program enhancements. Sharp’s alliance with Close the Loop adds to a history of action from Sharp to improve the environmental impact of its products by engaging customers and including them in the effort. Other current recycling initiatives from Sharp include participation in the U.S. Environmental Protection Agency’s “Plug-In to eCycling” program, created to reduce the environmental impact of electronic products during their production, use, transport, recycling and disposal, and co-founding and participation in the Electronic Manufacturers Recycling Management Company. Visit our web store for Sharp printer cartridges and Sharp copier toner supplies. Since the start of 2012, at least eight OEMs have raised consumables prices. We recently learned that Xerox became the ninth as of March 22. The company has provided us with some details on the increases. In February, Xerox sent a letter warning resellers that it would raise U.S. list, estimated retail prices (ERP), and distributor net prices on select supplies as of March 22. It is a scenario that has become all too familiar. Since December, the industry has seen similar announcements from: Brother, Canon, Epson, HP, Kodak, Lexmark (which has instituted two rounds of price increases on consumables), Ricoh, Samsung. A Xerox spokesperson confirms that the company has raised prices on Xerox-brand consumables for Xerox hardware. Xerox also markets a branded line of third-party cartridges for Brother, Hewlett Packard / HP, and Lexmark devices, but to the best of our knowledge, the OEM is hiking prices only on branded supplies for its own hardware. The spokesperson attributed the price increases to currency fluctuations and increasing freight and fuel costs. Altogether, Xerox is raising prices on about 225 consumables, including solid ink sticks, toner cartridges, drums, imaging units, fusers, and other maintenance items used in ColorQube, Phaser, and WorkCentre-branded devices, both monochrome and color. The spokesperson points out that the price increases impact roughly half of Xerox’s lineup of consumables for Xerox hardware. Some OEMs, such as Brother and HP, have increased prices most steeply on legacy supplies items, and it seems that Xerox may be doing the same. Profit margins narrow over time on legacy supplies as the installed base of hardware dwindles, demand decreases, and the aftermarket increases its share of the replacement supplies market. Meanwhile production costs for the OEM increase as cartridges for legacy products are needed in smaller volumes. Most of the OEMs that have raises supplies prices have cited as reasons for the increases currency fluctuations, global economic conditions, and rising production, transportation, and raw material costs. However, there is another far more depressing reason that to date we have only heard beleaguered Kodak mention outright—the need to make better profit margins. The need to maintain and even increase supplies margins becomes more pressing as print volumes and thus supplies sales decline in some segments. As most who follow OEM financial results know, printer and copier OEMs had a tougher-than-expected year in 2011, and thus far 2012 has provided no relief. HP, for example, reported a 6 percent decline in supplies revenue in the first quarter and said that the overall printing market is mature. Meanwhile, in the fourth quarter, Xerox saw a 3 percent decline in sales of hardware, flat revenue from annuities including supplies, and a 4 percent decline in sales of third-party cartridges, paper, and other products. With so many OEMs raising supplies prices, no one OEM stands to benefit or gain share at the expense of another. However, the aftermarket may see some increase in business resulting from OEM price increases, particularly on legacy products. Higher prices on original supplies make end users more likely to use remanufactured or compatible cartridges. That said, third-party supplies vendors are dependent on a healthy OEM hardware and supplies business to thrive long term. Thus, everyone in the industry will have their eyes on OEM financial results when they start coming in at the end of April. Sick of getting gouged for ink? We did the math to figure out which printer manufacturers offer decent deals and which ones really stick it to you. If you buy a cheap inkjet printer, you're going to pay a small fortune for the ink to run it (assuming that you use the ink that its manufacturer specially designed for it). Even so, the size of the bill depends to a great extent on which brand of printer you buy. Some printer makers, like Kodak, work hard to keep their ink prices reasonable, while others, like Dell, consistently charge top dollar. When you look at as many inkjet printers and multifunction printers as I do--about 40 per year, representing about half of the total number of models currently available from major vendors--you start to see trends in ink pricing. I maintain a dynamic average of ink costs that shifts as I add new printers to the list and retire old ones. The averages have remained fairly stable over the past few years: For standard-size ink cartridges, which generally yield about 250 pages or less, the average price per page is about 4.8 cents for pages that use only black ink, and it's about 13.8 cents for prints that use all four colors. High-yield cartridges have more ink and print more pages--in some cases, thousands more pages--and like most bulk purchases, they cost less in the long run. The average costs for large, high-yield cartridges are about 3.4 cents per page for black and 10.4 cents for a page with all four colors. Kodak's ink is one of the best deals on the market, regardless of the particular model you buy. For the $100 Kodak ESP C310 multifunction printer, for example, the cost of black ink works out to a very reasonable 3 cents per page, whether you're using the printer's standard-size or high-yield ink cartridges. Add in cyan, magenta, and yellow, and the cost rises to 9.5 cents per page for a standard-size cartridge, but that's still more than 4 cents per page below the average ink price per four-color page. For high-yield color cartridges, Kodak's price is 9.2 to 9.5 cents per four-color page--still well below the average. Cheap ink isn't everything, of course. We've encountered problems with the speed, features, and print quality of Kodak printers in the past. The company has improved its most recent models somewhat on those variables--just in time for its bankruptcy filing. 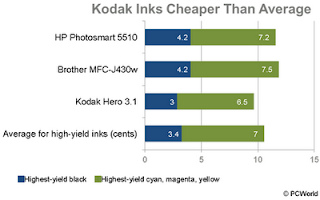 Inks from Brother and HP aren't close to Kodak's prices, but they do tend to be about average. The Brother MFC-J430w MFP, which costs just $100, offers high-yield inks that ultimately cost 4.2 cents per page for black and 11.7 cents for all four colors; both of those figures are slightly above average. For the same printer price, the HP Photosmart 5510 MFP matches the MDC-J430w's 4.2 cents per page for high-yield black and costs 11.4 cents per page for four-color pages. Epson's ink prices are a slightly different case. You'll find reasonable pricing in its creativity-oriented Artisan and business-minded WorkForce product lines: The Epson Artisan 837 MFP, for instance, costs just 3.3 cents per page for black and 9.2 cents per page for four-color printing, while the Epson WorkForce 845 all-in-one charges 3 cents for black and 10.2 cents for all four colors. The home-oriented Stylus product line is an exception. 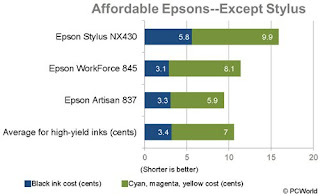 Standard-size ink cartridges for the Epson Stylus NX430 MFP have higher-than-average costs of 5.8 cents per page for black and 15.7 cents per page for all four colors. The Stylus product line also gives users the option of buying what Epson calls "moderate" cartridges, with page yields lower than those of the standard-size cartridges: just 200 pages or so. Those inks are even pricier: 6.2 cents per page for black and almost 18 cents for a page with all four colors. 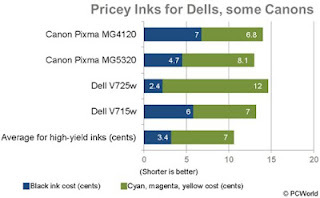 Dell's multifunction inkjet printers historically have some of the priciest inks around. The Dell V715w MFP has standard-size cartridges that currently cost 8.9 cents per page for black pages and 20.6 cents per page for four-color pages. The high-yield cartridges drop those figures to a more palatable 6 cents per page for black and 13 cents per page for all four colors. The company's newly announced V525w and V725w models have standard-size cartridges that cost a slightly above-average 5 cents per page of plain black text, but an atrocious 27.5 cents per page for all four colors. The extra-high-yield black is an affordable 2.4 cents per page, but the four-color cost remains high at 14.4 cents. Canon printers priced at $200 and above tend to have reasonable ink costs. Among the company's sub-$200 models, however, such as the Canon Pixma MG4120 MFP, you'll find black-ink costs of 7 to 7.3 cents per page. The color inks are more reasonably priced, with a four-color page coming in at a middling 13.8 cents. Canon's only inexpensive printer with reasonably priced inks is the $150 Canon Pixma MG5320 MFP. It does not offer high-yield cartridges, but its standard-size cartridges cost 4.7 cents per page for black and 12.9 cents per page for a four-color page--cheaper than average for that size. Recent inkjet printers from Lexmark have improved noticeably in overall quality, but the company's ink prices remain a mixed bag. Lexmark's high-yield cartridges often have startlingly low costs per page. 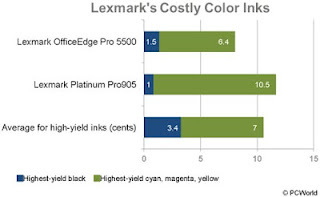 But the prices go up sharply for standard-yield cartridges Among other Lexmark inkjets we've tested, two MFPs--the small-office Lexmark Pinnacle Pro901 and the Lexmark Platinum Pro905--use standout high-yield inks: a special 510-page black cartridge (the 105XL) costs $5, or a scant 1 cent per page. With that black and the high-yield colors, you'll currently pay 11.5 cents for a four-color page, which is about average. Unfortunately, the prices for the standard-size ink cartridges are outrageous: 11.2 cents per page for standard-size black and 29.2 cents for all four colors. Of course, many more printers are available than I've mentioned here. So how do you figure out whether the ink for a particular printer will break your budget? The math is actually pretty easy. For any printer you're considering, look at each ink cartridge and divide its price by the vendor's stated page yield. This computation will give you a simple cost per page, just for the ink. Most vendors use an industry-standard yield test that makes comparison much easier than it used to be. If the manufacturer offers high- or low-yield cartridges in addition to standard-size versions, figure out those costs as well. It's also important to think about how much you'll likely be printing. High-yield cartridges are relatively cheap, but if you print infrequently, you'll end up with more ink than you need and risk having the print head dry out. If you buy low-yield cartridges but end up printing a lot, you'll be replacing cartridges constantly--and shelling out serious bucks for them. Hewlett Packard / HP is releasing four new inkjets aimed at small offices/home offices (SOHO) and small and medium-sized business (SMB) customers. The lineup includes one single-function printer, the Officejet 6100 ePrinter, which replaces the Officejet 6000. The three new multifunction inkjets, the Officejet 4620, Officejet 6600, and Officejet 6700 Premium e-All-in-Ones, replace the Officejet 4500, Officejet 6500A, and Officejet 6500A Plus, respectively. The Officejet 6600 and 6700 are currently shipping worldwide, and the Officejet 4620 and 6100 will be available in April. The Officejet 4620 is based on a previously released engine design and consumables, but the Officejet 6100, 6600, and 6700 are based on a new imaging system that uses new ink tanks. Looking at the most interesting models first, the Officejet 6100, 6600, and 6700 appear to leverage some technology from HP’s recently refreshed Officejet Pro lineup. Specifically, the new four-color pigmented ink set that offers "improved water-, fade-, and highlighter pen resistance" sounds similar to that used in the Officejet Pro models. The Officejet 6100, 6600, and 6700 use a new thermal print head, but HP was mum on specifications and details. We suspect that the print heads in the new machines are leveraged from the heads deployed in the latest Officejet Pro units released last fall. We cannot confirm this, however, because HP has been uncharacteristically silent about its most recent generation of desktop print heads. Like the heads in the higher-end machines, the print heads for the Officejet 6100, 6600, and 6700 are permanent and designed to last the life of the machines. 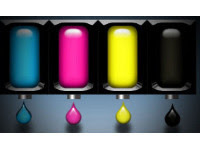 HP is introducing a new series of individual ink tanks with the Officejet 6100, 6600, and 6700: the HP 932/932XL black tanks and the HP 933/933XL cyan, magenta, and yellow ink tanks. The three new machines all ship with the standard-yield tanks. As for the Officejet 4620, this machine uses a permanent print head and the HP 564/564XL individual ink tanks, which HP first began using in 2008. The machine it replaces, the Officejet 4500, did not feature individual tanks and instead employed the HP 901 integrated cartridge series. The four-color print head typically used with the HP 564/564XL tanks has 720 nozzles for black and 672 per color for a total nozzle count of 2,736. (Some models that use the HP 564/564XL tanks also use a photo black tank and have more nozzles.) The heads eject drops as small as 13.8 picoliters for the pigmented black ink and 1.3 picoliters for the dye-based color inks. Unfortunately, HP was unable to confirm that it uses this exact same print-head configuration in the Officejet 4620, but more likely than not the print head is the same one we have seen previously, most recently in the Photosmart 5510 and 6510. In 2010, HP replaced the original HP 564XL black tank, which had a yield of 800 pages and a price of $34.99, with a version that had a lower yield of 550 pages and a lower price tag of $22.99. The Officejet 4620 ships with the standard-yield HP 564 tanks. The Officejet 4620 is a low-priced ($99) four-in-one inkjet with wireless networking and a 2.0-inch monochrome LCD, which are nice features at this price point. Its main improvement over the model it replaces is its faster print speeds. The Officejet 4620 prints black-and-white documents at an ISO-rated speed of 8 ppm and color jobs at 7.5 ppm versus the Officejet 4500’s print speeds of 6 ppm in black and 4 ppm in color. Other enhancements include a faster 240 MHz processor (up from 192 MHz) and a 35-sheet ADF (versus the 20-sheet ADF on the Officejet 4500). The price/performance ratio of the Officejet 4620 is significantly improved over the Officejet 4500 because the machines feature identical price tags. The Officejet 6100 is a $99 single-function inkjet with USB, Ethernet, and wireless connectivity. The $149 Officejet 6600 and $169 Officejet 6700 Premium are four-function devices that are differentiated by print speed, connectivity, and automatic duplexing. The Officejet 6600 prints at 14 ppm in black and 8 ppm in color based on the ISO standard, while the Officejet 6700 Premium prints at 16 ppm in black and 9 ppm in color. The Officejet 6600 lacks automatic duplexing and has USB and 802.11b/g/n Wi-Fi connectivity. (The Officejet 4620 and Officejet 6100 do not offer support for the latest 802.11n standard.) Meanwhile, the Officejet 6700 Premium includes automatic duplexing and adds a front USB port and Ethernet connectivity. All four models support HP ePrint and Apple AirPrint. Both the Officejet 4620, which uses old supplies, and the Officejet 6100, 6600, and 6700, which use new supplies, offer cost-per-page (CPP) figures that are fairly competitive for their class. For example, the HP 564XL tanks result in per-page costs of 4.18 cents in black and 11.38 cents in color. The Officejet 4620 offers the lowest color CPP of all the $99 inkjet all-in-ones we could drum up that were similarly featured. The Officejet 4620’s monochrome CPP is not class-leading but neither is it on the high side for a $99 inkjet all-in-one. The Officejet 6100, 6600, and 6700’s new HP 932XL and HP 933XL tanks result in per-page costs of 3.20 cents in black and 9.01 cents in color. While these figures may seem high compared with those of some recently introduced business-class inkjets such as HP’s own Officejet Pro line, Brother’s Professional Series all-in-ones, Epson’s WorkForce Pro models, and Lexmark’s OfficeEdge series, the CPP figures of the new HP machines are actually pretty good compared with those of other inkjet devices at similar price points.